Ashwariya Barse from Aurangabad, B.E. - B.Tech Graduate. Working for : Sangkaj Steel LTD. Currently working as Assistant HR at Sangkaj Steel LTD.
are one of expert skill area's of Ashwariya Barse . 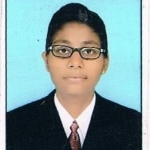 Ashwariya Barse is working in Human Resources industry.